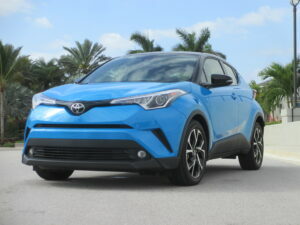 Stylish, athletic and filled with technology like Toyota Safety Sense P™ (TSS-P), the Toyota C-HR (introduced in 2018) – or, Coupe High-Rider – represented a leap forward in design, manufacturing and engineering for Toyota. 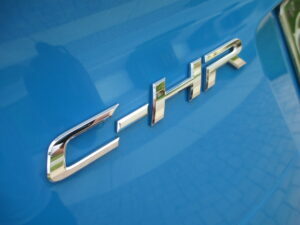 The C-HR serves as a springboard of excitement and wanderlust for its trendsetting drivers. First shown in concept form at the 2014 Paris Motor Show, the 2018-2019 C-HR maintains the concept’s avant-garde physique; modern, comfortable cabin; and bold, outgoing character. 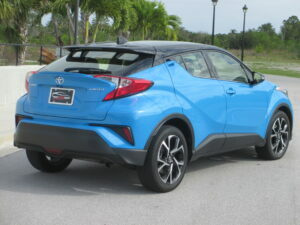 The C-HR is available in two grades, XLE and XLE Premium, each equipped with a long list of standard features that includes 18-inch alloy wheels, dual-zone climate control, bucket seating, and 7-inch audio display. But, the C-HR doesn’t only look great – it’s got the sportiness to impress thanks to the efforts of Deputy Chief Engineer, Hiro Koba, who is a diehard racer with speed coursing through his veins. Koba-san and team made sure the C-HR exhilarates its driver anytime, anywhere, including around the famed Nürburgring circuit where vehicle development was chiefly executed. Like its uncanny looks, the C-HR’s blend of comfort, control, consistency, and responsiveness is extraordinarily impressive for the competitive paradigm it aims to shift. At the C-HR’s nose, two slim projector-beam halogen headlights with LED daytime running lights (DRL) and auto-on/off activation wrap deep into its toned shoulders – nearly all the way into the front quarter panels. 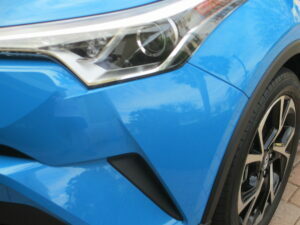 Because of this, the vehicle looks wider than it is, and possesses an assertive fascia that’s uncommon in the segment. In fact, its dimensions – width (70.7 in. ), height (61.6 in), length (171.2 in. 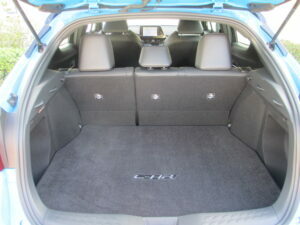 ), and wheelbase (103.9 in.) – can best be described as compact and neat. 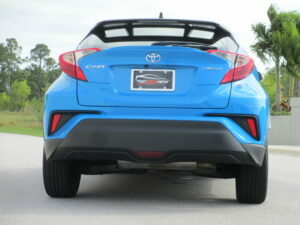 Its front and rear tracks match that of Toyota’s diehard sports car, 86, at 60.6 inches. 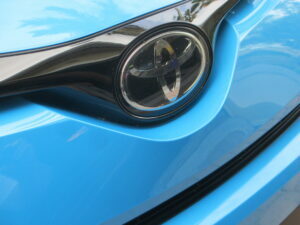 Deep, curvy character lines emerge from a prominent Toyota badge that’s flanked by the headlamps, and lead into the narrower core body. 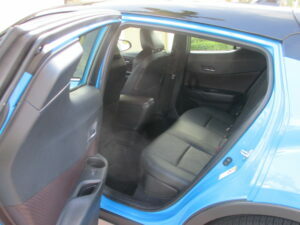 and distinctive C-Pillar with hidden-type design door handle. Look closely at the silhouette to see the clear resemblance of a diamond set on its side. 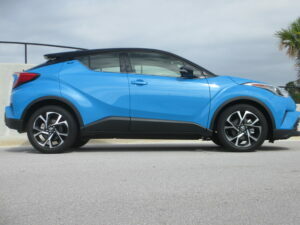 Powerful arches housing the “vortex-styled” 18-inch tall by 7-inch wide aluminum wheels and 225/50R-18 all-season tires accentuate the C-HR’s sturdy posture. The rear is a cohesive balance of its elaborate lines and 3D shapes. 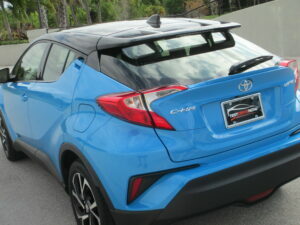 The tail lamps protrude outward, and the hatchback – outfitted with a lip spoiler and functional color-matched cantilevered wing – tapers neatly inboard, adding to the C-HR’s futuristic look, and, once more, imposing stance. Toyota’s aerodynamicists pulled no punches when honing the C-HR’s 0.34 coefficient of drag. Canards on the rear quarter panels, front and rear spats, a streamlined rear lower bumper, and stabilizing fins integrated into the taillights all manage critical airflow in and around the body. Underneath, a bevy of rigid covers – on the engine, floor, fuel tank, and aft of the rear wheels – cull turbulence, and in doing so, help enhance vehicle control and fuel efficiency. At the rear, its aerodynamic details continue: The lower arms of the double-wishbone style multi-link rear suspension have a streamline edge. 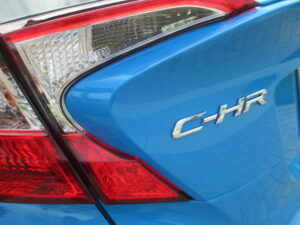 As one can imagine, the exterior color options are aplenty for C-HR. 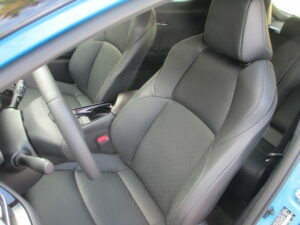 Available colors include Ruby Flare Pearl, Blizzard Pearl, Magnetic Gray Metallic, and Black Sand Pearl. 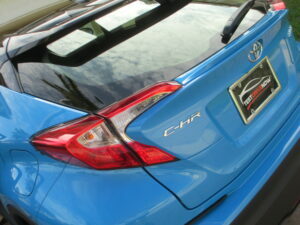 Available all new-for-Toyota colors include Silver Knockout Metallic and Blue Eclipse Metallic. For a bigger dose of individuality, the C-HR can be outfitted in R-Code, a special paintjob that pairs body color with a white-painted roof, side mirrors, and A-pillar for a truly custom look. 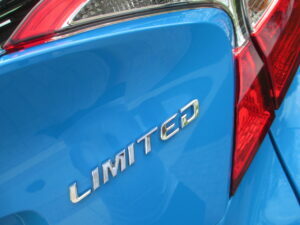 Available pairings include Blue Eclipse Metallic R-Code, Ruby Flare Pearl R-Code, and Radiant Green Mica R-Code. Radiant Green Mica can only be had in R-Code configuration. 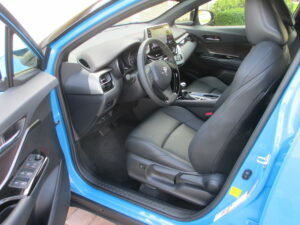 spacious, and uncluttered interior having a keen placement of diamond accents and a driver-centric “MeZONE” orientation. Along with the soft-touch materials covering surfaces throughout, the diamond pattern influences the designs of the dual-zone climate controls, speaker surrounds, and black headliner above the front passengers. 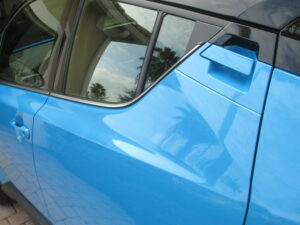 Passengers can easily converse thanks in large part to the acoustic noise-reducing front windshield. Together with slim A-pillars, the slightly angled dashboard and amenity controls allow for the driver to have a clear view of the road ahead and intuitive access to instrumentation – a nod to the C-HR’s sports car influence. The 7-inch audio display is positioned centrally atop the dash, rather than in it, so as to help reduce a driver’s eye movements. 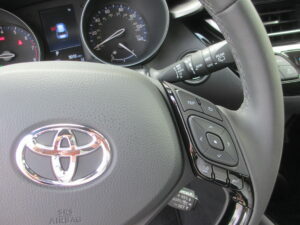 An informative twin-ring gauge cluster resides behind the leather-wrapped multi-function steering wheel. The tilt/telescoping wheel, with its slender profile, small diameter, and compact center pad, is reminiscent of a sports car’s easy-to-grip helm. The satin-plated shift knob exudes a high-quality feeling, and once in-hand, has a solid shift movement. A bright 4.2-inch color Multi-Information Display (MID) sits between the twin-ring cluster and shows odometer, SPORT and ECO modes, outside temperature, fuel economy and trip information, fuel economy history, G-force monitor, and much more. Key XLE standard features include all-black appointments; premium leather-wrapped steering wheel; auto-dimming rearview mirror with backup camera; electric parking brake; dual-zone climate control; and Sport Fabric-trimmed front bucket seats with sport bolsters and six-way adjustability. 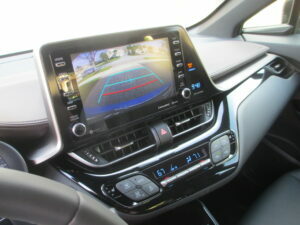 XLE Premium adds Blind Spot Monitor and Rear Cross Traffic Alert; heated front seats; eight-way adjustable power lumbar driver’s seat; and Smart Key System with Push Button Start. Both models are equipped with a six-speaker AM/FM/HD Radio™, Aha™ app, USB 2.0 port with iPod connectivity and control, AUX audio jack, Bluetooth® wireless connectivity, and Voice Recognition with voice training. The C-HR receives two Toyota-first features: Driver Distraction Secure Audio (DDSA) and Brake Hold Function. DDSA prevents certain multimedia menus from being selected while the vehicle is in motion by complying with NHTSA’s Driver Distraction Guidelines. Brake Hold Function is a convenience feature that maintains braking force at all four wheels to keep the vehicle stationary when at a full stop. 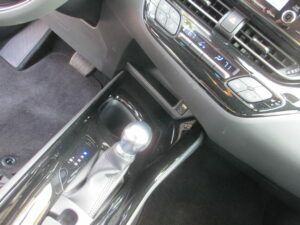 As a result, the vehicle will remain still even if the driver reduces the pressure on the brake pedal. Once the driver depresses the accelerator, brake pressure will release, and the vehicle will move forward. For extra cargo carrying versatility, the rear 60/40 seat can split and fold flat, and, when in an upright position, can easily accommodate child seats with its LATCH (Lower Anchors and Tethers for Children) system. 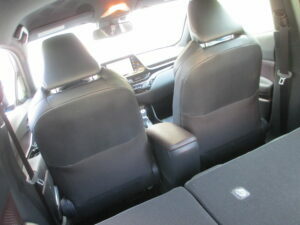 Seatback lock releases are positioned at shoulder height, making it possible to fold seats without bending over. 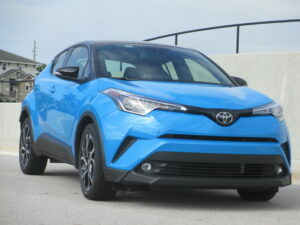 The Toyota C-HR scores high on style points, but it is also a hit when it comes to thrilling fun and impressive ride comfort. 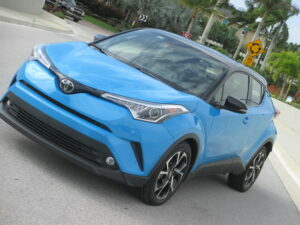 Deputy Chief Engineer Koba took full advantage of the C-HR’s adaptable Toyota New Global Architecture (TNGA) C-Platform to craft an engaging character that goes well beyond just a cool appearance. The C-HR’s core driving personality incorporates the ingredients of a well-sorted sports car – one that seamlessly melds cunning responsiveness, linearity, consistency, and comfort. The newly developed MacPherson strut front suspension with SACHS dampers has angled strut bearings and a large diameter stabilizer bar to help the C-HR’s front end respond quickly and precisely at initial corner turn-in. And at the rear, an all-new double-wishbone style multi-link rear suspension utilizes a 26-mm stabilizer bar and SACHS dampers with urethane upper supports – a first for Toyota. The material, together with an aluminum-cast upper support housing, aids in the dampers’ absorption efficiency, and therefore, greatly benefit passenger comfort, cabin quietness, and vehicle agility. 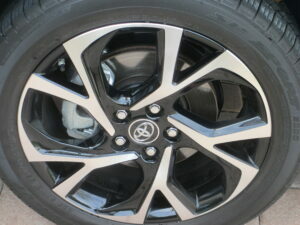 Braking is handled brilliantly by a pairing of 11.7-inch front ventilated discs with 11.1-inch rear solid discs. For all of its sportiness, the C-HR’s ride quality is well-sorted, civilized, and highly capable in absorbing the nastiest of untidy pavement. In the end, the C-HR happily finds itself at home on congested boulevards as it does on serpentine roads. 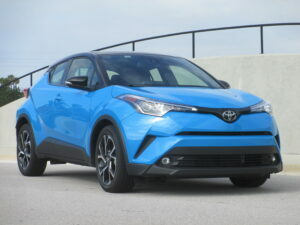 The C-HR’s engine, a punchy 2.0-liter four-cylinder dual-overhead cam producing 144 horsepower at 6,100 rpm and 139 pound-feet of torque at 3,900 rpm, sends all power to the front wheels via the Continuously Variable Transmission with intelligence and Shift mode (CVTi-S). 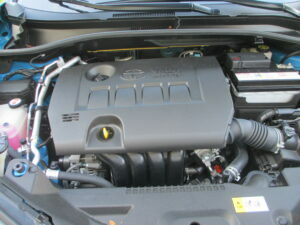 The engine employs many of Toyota’s latest generation of technologies, including Variable Valve Timing (VVT) and Valvematic, both of which have received extensive optimization to enhance fuel economy and smooth operation. Valvematic offers a broader range of continuously variable valve timing (lift and phasing) to provide optimal intake valve (not on exhaust side) operation relative to engine demands. 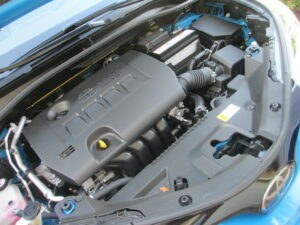 Furthermore, to reduce exhaust emissions, the catalyst is warmed earlier during the engine’s ignition cycle. 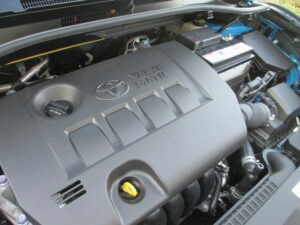 Both models are expected to receive EPA-estimates of 27 city/31 highway/29 combined miles-per-gallon. Of course, drivers and passengers will welcome the powertrain’s well-sorted nature, but they’ll love Sport mode and the simulated 7-speed Sequential Shiftmatic. Engaging Sport mode via the MID increases the responsiveness of the throttle, quickens the CVT’s automatic artificial “step-up” shifts, and maintains high engine speed to enhance acceleration. The EPS’ feedback is weightier for a more confidence-inspiring feel. 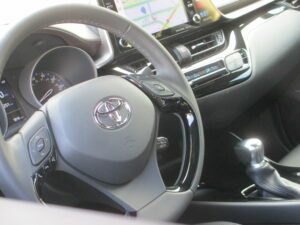 Pushing the gearshift over to the left while in Drive engages Sequential Shiftmatic, and lets drivers shift simulated gears at their convenience. The C-HR comes equipped with standard Toyota Safety Sense P™ (TSS-P). 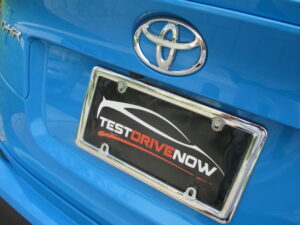 It is anticipated to be the only vehicle in its segment with standard Pre-Collision System with Active Braking. It is also expected to be the only vehicle in the compact crossover market with Full-Speed Range Dynamic Radar Cruise Control as standard equipment. TSS-P is a multi-feature advanced active safety suite that bundles Pre-Collision System with Pedestrian Detection function (PCS w/PD) featuring forward collision warning and Automatic Emergency Braking; Lane Departure Alert with Steering Assist function (LDA w/SA); Automatic High Beams (AHB); and Full-Speed Range Dynamic Radar Cruise Control (DRCC). 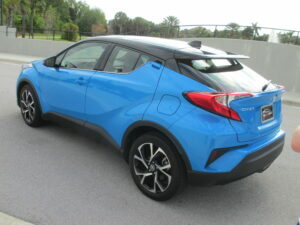 The Pre-Collision System with Pedestrian Detection (PCS w/PD) uses a camera and radar to detect a vehicle and/or pedestrian ahead of the C-HR in certain conditions. When the system determines there is a possibility of collision, it prompts the driver to brake with an audio and visual alert. 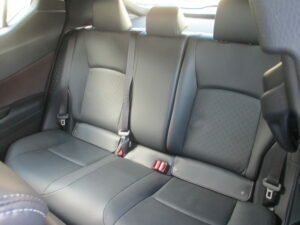 If the driver notices the hazard and brakes, the system may provide additional braking force using Brake Assist. If the driver fails to brake in a set time and the system determines that the risk of collision with a vehicle and/or pedestrian is extremely high, the system may automatically apply the brakes, reducing speed in order to help the driver avoid the collision or reducing the impact. Complementing TSS-P are 10 standard airbags, standard Hill-Start Assist Control (HAC) and rear backup camera, as well as available Blind Spot Monitor with Rear Cross Traffic Alert, which are only available on the XLE Premium model. Toyota’s 36-month/36,000 mile basic new-vehicle warranty applies to all components other than normal wear and maintenance items. Additional 60-month warranties cover the powertrain for 60,000 miles and corrosion with no mileage limitation. 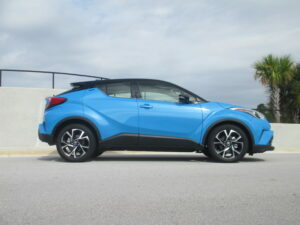 The C-HR also comes standard with Toyota Care, a complimentary plan covering normal factory-scheduled maintenance and 24-hour roadside assistance for two years or 25,000 miles, whichever comes first.